Combining modern fittings with a sleek, minimalist style, contemporary bathrooms make a stylish yet functional addition to a home. Whether you're looking to give your bathroom a contemporary feel with statement additions or are searching for decorating inspiration, our contemporary bathroom design ideas showcase the latest in fixtures, fittings and accessories. Get design inspiration for your contemporary bathroom here. Then, check out our guide to designing a bathroom from scratch to get your room revamp just right. While a sleek and simple scheme is a great starting point when designing a contemporary bathroom, you'll want to consider experimenting with texture and visual effects to create a unique space. Despite having a characteristically minimalist feel, the addition of a stylish display idea for this statement house plant gives the space personality. For more house plant display ideas, check out of gallery. An on-trend, geometric inspired bathroom tile scheme makes a striking addition to a contemporary bathroom. Consider opting for a monochrome scheme if you want a more muted finish and couple with stand out brass fittings. Small bathroom? Find out how to choose the right size tiles to make your bathroom feel bigger and brighter. We love this look from The Baked Tile Company. The addition of an intricate monochrome wall mural to this small bathroom creates a stunning focal point, drawing the eye and creating the illusion of a longer space – a great trick if you're looking for small bathroom design ideas. Paired with a stylish, matte-black freestanding bath and statement light fitting, this bathroom is a great example of a successfully unique contemporary space. Find this striking light fitting at DelightFULL. With grey and monochrome schemes often acting as the backdrop to contemporary bathrooms, the addition of an accent feature is a great option for adding colour and interest to a space. Mustard yellow or blush pink are on-trend options for a grey scheme. See more paint colour scheme ideas for bathrooms in our gallery. 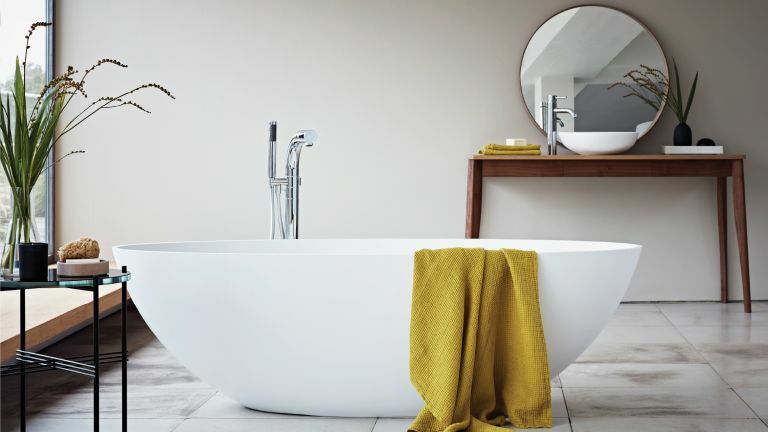 Find this Brook² Freestanding Bath at Waters Baths. Incorporating natural materials – wood being a stylish example – into a sleek, cool toned scheme is a great way of adding texture and interest to a contemporary bathroom without compromising its minimalist feel. We love this combination of a dark wood freestanding unit and streamlined sanitaryware from GSG Ceramic Design. When designing a bathroom with a contemporary style, prioritise creating an open and spacious feel (if possible). Walk in wet rooms are a great example of how this can be achieved effectively as they encourage the layout of a space to remain as simple as possible. Zones can still be created without detracting from the open feel. Natural Slate Effect Tiles are a stylish solution for a contemporary bathroom or wet room. If you love the idea of transforming your bathroom into a wet room, check out our guide to creating a wet room for all the tips and tricks. Having been proven to encourage wellbeing, zen-enhancing house plants are a must for a contemporary bathroom. Whether you're looking to make a design feature with a statement species – we love the addition of a slightly unruly house plant to this otherwise streamlined space – or prefer something a little more understated, our house plants guide will tell you everything you need to know about house plants, so that you can choose a species that suits. Avoid a clinical feel and inject personality into a contemporary bathroom with the addition of a gallery wall. Start by reading our guide to displaying photos and pictures before selecting images that suit your style – we'd recommend an eclectic combination of tasteful photographs and prints. Haze freestanding bath, Waters Baths of Ashbourne. Lighting is key if you're designing a bathroom with relaxation in mind. Avoid bright, overpowering lights and instead opt for something with a warmer light and more understated feel. Industrial feel pieces make the perfect addition to a contemporary bathroom. For more on how to choose bathroom lighting go and have a read of our expert guide. Find this Hex Box Pendant Lighting at Original BTC. Smooth edges and simple silhouettes make for stylish sanitaryware in a contemporary bathroom. Positioned in the centre of a bathroom (if yours is large enough) a statement bath can create a striking focal point, just check out these amazing freestanding baths! Creating a feature wall with exposed bricks is one way to create a contemporary industrial look, especially if paired with factory-style light fittings, like these from Fritz Fryer. The downside to this pared back look? The bathroom can feel cold, so ensure there's underfloor heating beneath the tiled floor and plenty of cosy towels to dry off with. One way to make your bathroom feel larger is to choose bathroom window treatments that are minimalist – like this white Roman blind, just peeking into shot. However, if your room is overlooked, you might like to add window film to allow in plenty of light while preserving your privacy. Bear in mind, too, that if the window is undressed, the room might feel somewhat cold, so up the comfort factor with plenty of quality towels and pretty accessories to dress the room – these are from JD Williams. Part contemporary, part period style – and bang on trend now, boho chic interiors are all about paring back a traditional scheme to the minimum and adding a couple of stand-out modern details. Here, it's the artwork, but it could just as easily be a shapely rolltop bath or contemporary flooring. Find more boho chic-inspired room schemes in our guide.